I moved into a new apartment in early September and everything is pretty color-coordinated, monochrome and minimalistic. Well, unless you look into my closet, but that's another story. Most textiles are either white or patterned in black and white. I like the contrast and the simplicity of it, and when I realized that I needed a storage solution for the landing strip in my hallway, I started to look for baskets in black and / or white. Until I noticed the sheets of heavy black paper that were left over from my Christmas gift wrapping. The baskets are woven and all four of the baskets were made over the course of an evening where I watched reruns of "White Collar" on Netflix - yeah now we finally have Netflix in Austria! When you cut the stripes, make sure to plan the size of your stripes accordingly to the size you want the finished basket to have. I wanted a variety of sizes, so I basically started the first basket with a square consisting of 5 x 5 stripes. You can also pick an even number, both works just fine! Begin by weaving the stripes. Once you are done weaving an area that is large enough for the bottom of the basket, just fold the stripes upwards and start weaving horizontally. Another detail you can decide on is the distance you want the stripes to have. A bigger gap between two stripes makes for a more light looking basket. Once you've reached your desired height, bend over the stripes and staple them down with your stapler. 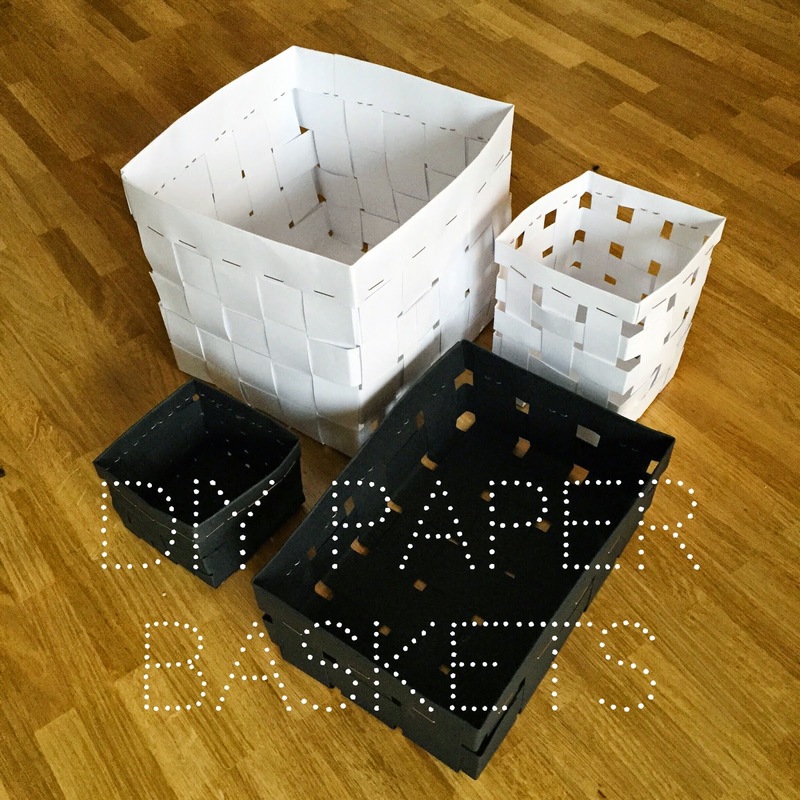 Congratulations on your first paper basket! And now, make more. They look good in pairs!